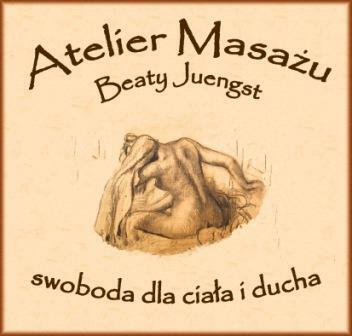 Massage Atelier of Beata Juengst in the Center of Bydgoszcz was established with a view to pursuing passion which is to give comfort and relaxation, and maintenance of health. As a massage therapist I see the massage not only as a profession, but also as a way to pursue my passions. When you do the massage and you put your heart and attention into it and to the person being massaged, it becomes an art, and thus affects not only the body but also on the state of mind and emotions. In the Massage Atelier Massage your health, peace and harmony build mutual satisfaction. I offer you classic-therapeutic massage, intuitive massage, relaxing massage, Lomi Lomi massage, Ayurvedic massage (whole body massage - Abhyanga, massage of the face, neck and shoulders - Mukabhyanga, Udvartana firming massage, massage with semi-precious stones - Ratnabhyanga, head massage - Shirodhara Massage feet - Padabhyanga), massage, Chinese bubbles, coffee scrub and massage with chocolate. Massage is not only „a feast for the body ” and relax for a few, which can be experienced in the salons of the SPA. . In the process of thought and individually selected treatment of the body, while offering my massage, your physicality, and spirituality harmoniously is to reach equilibrium. In this harmony you will find invaluable potential to treat chronic and temporary pain. The wisdom of massage derived from Indian and Chinese medicine, where the disease is defined as a disturbance of the inner man, both on the ground physically and mentally. The basis of health is the inner harmony we find in massage treatments at the Massage Atelier of Beata Juengst. - Improve blood circulation, the proper drainage of the veins, reducing pressure on the tissue and blood vessels, which in the long term is beneficial in regulating blood pressure, prevention of muscle atrophy, bedsores, etc. - Attention paid to your spirituality, to find harmony between it and the body and the consolidation of internal equilibrium. More than welcome to the massage!